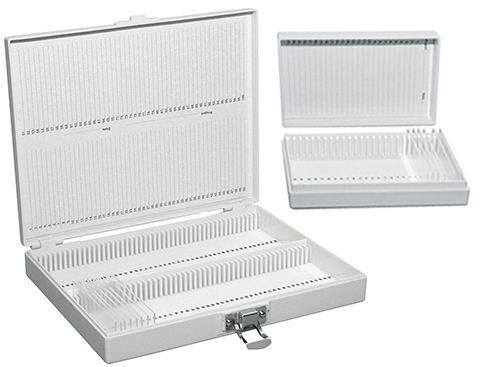 Exceptional slide storage containers providing maximum protection for your microscope slides. 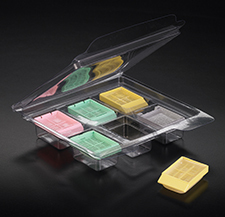 Support efforts to promote breast cancer awareness with our PELCO® Microslides Think Pink Storage Boxes. Ted Pella, Inc. will donate $0.25 for every box sold to our local cancer awareness chapter, Nor-Cal Think Pink. The Nor-Cal Think Pink chapter originated the campaign in 1997 that has now become a national effort and symbol promoting breast cancer awareness. Desktop storage system for 50 and 100 slide storage boxes. 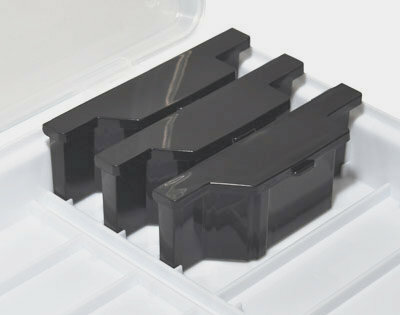 Indexed, compact and durable, these smooth injection molded high impact plastic microscope slide boxes provide the best in microscope slide protection for the histology laboratory. Heavy walls will not warp, splinter or crack; material is unaffected by humidity and is thoroughly insect proof. Cover and bottom have numbered index sheet in the lid for quick identification and units are stackable. Soft, white foam layer in bottom part. Made of ABS. The unique and durable polycarbonate construction of the Cryo Compatible Slide Box, protects your 3 x 1" (75 x 25mm) slides in ultra-low temperature ranges to -80°C (-112°F). Available in a 100-slide and a 25-slide capacity box with grooved slots to prevent slide to slide contact. The Cryo Compatible Slide Boxes offer a permanent numbered index sheet in the lid that corresponds to the numbering on the temperature-resistant foam lining in the base. These features provide ideal inventory maintenance ability. The boxes are stackable and can be autoclaved. 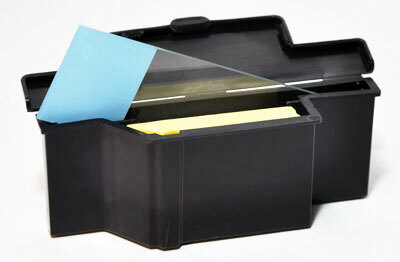 The Handy Slide Box has capacity of 100 3 x 1" or 75mm x 25mm slides, numbered index in hinged lid. Soft cork layer in bottom part. Stackable. 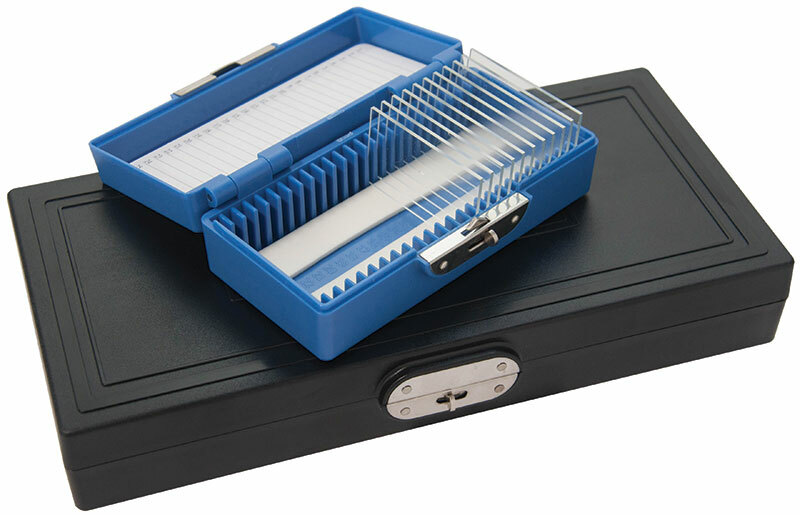 This large capacity microscope slide box is available in 6 colors. Black is recommended for light sensitive specimens. Made of polystyrene. 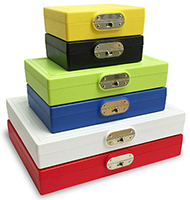 Sturdy polystyrene Mini Slide Storage Box with removable lid. 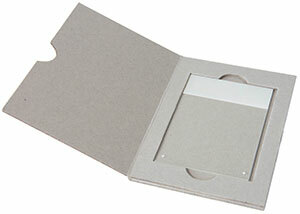 Holds 25 standard 3 x 1" or 75 x 25mm slides, numbered index in lid, soft cork layer in bottom part. Stackable. 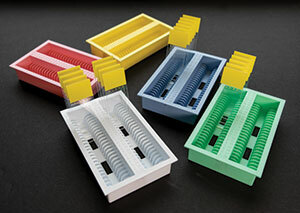 This compact microscope slide box is available in 6 colors. Black is recommended for light sensitive specimens. Available in 5 assorted colors: White, Orange, Silver, Blue, and Gray. Made from sturdy 1.93mm (0.076") thick chipboard. 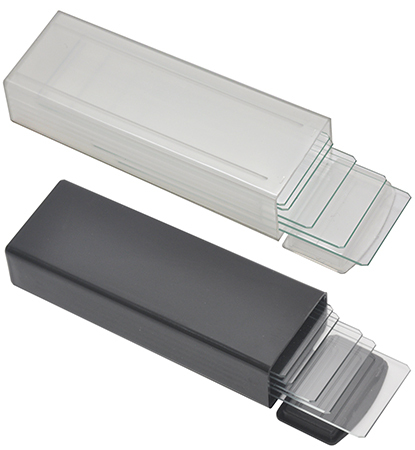 Holds one 75 x 50mm or 3 x 2" glass slide for easy mailing or storage. Flat plastic slide mailers are produced from polypropylene (PP) and feature a snap-close lid to keep slides secure during transport. The slide label may be read through a smooth finish area of the mailer without opening. The remainder of the exterior is a flat finish to allow notations done in permanent marker. Designed to accommodate 3 x 1" slides. 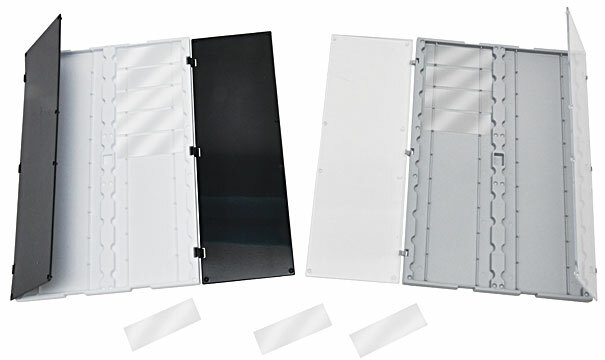 Pictured are the single, double and triple slide mailers in open position. 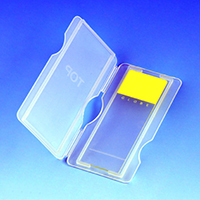 Disposable staining container is also useful for shipping, storing and handling of slides. Available in transparent and black (for light sensitive specimens). Polypropylene container holds 5 3 x 1" slides in place so they will not touch. Positive lock and flip-top. This sturdy Paraffin Block Mailer is made of PVC and created especially for paraffin blocks. The Paraffin Block Mailer has an attached lid and can accommodate up to 6 paraffin blocks. 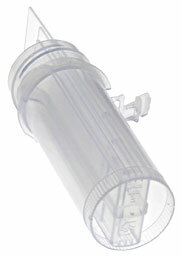 It is transparent and is suitable for all regular models of tissue and biopsy cassettes. 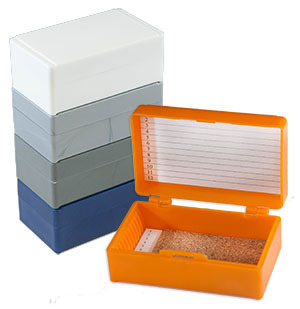 The LockMailer™ is a tamper proof multi purpose compact container for transporting, storing, mailing or staining microscope slides. It is constructed of extra-strong and clear polypropylene and will hold up to 4 standard 1x3" or 25x75mm slides vertically. The inside slotted channels will keep the slide safely separated. It incorporates a unique tamper evident leakproof screw cap made of HD polyethylene. The tamper evident screw cap avoids manipulation of slides without your knowledge. The LockMailer™ can also be used without the tamper proof feature. The caps on the Lockmailer™ can be color coded with the optional Capinserts™, available in different colors: blue, gray, green, lilac and orange. The Capinsert™ is inserted in the top of the cap and has a write frosted area for sample identification. The LockMailer™ is also an efficient staining vessel: the unique design has a reduced internal volume to decrease the amount of staining solutions needed; 14ml w/o slides. Only 12ml for 1 slide, 10ml for 2 slides, 8ml for 3 slides and 6ml for 4 slides of the staining solution is needed. Push up the attached tab on side of vial. Make sure it firmly clicks in place. Screw on tamper proof cap all the way. When opening the vial, the tamper evident ring will detach itself from the cap. The LockMailer can also be used without the tamper evident feature. A new model for storing or shipping one or as many slides as needed. 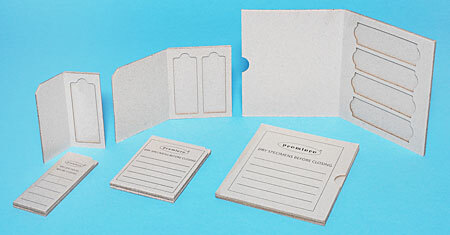 Made of high impact polystyrene and designed to accommodate 3 x 1" or 75 x 25mm slides with or without cover glasses. They fit snugly in a horizontal position on top of each other and are secured by an innovative locking mechanism. You may also insert a tamperproof tie through the hole or attach an ID label. Identification markings can be made on three sides or on top. Available in 3 colors for easy sorting. Supplied in packages of 100. Each Mailer conforms to U.S. Postal Regulations regarding minimum size for First class Mailing. These sturdy Pop-Up Slide Holders hold 20 or 30 standard 3 x 1" slides in compartments numbered to correspond to the printed index on the cover. The compartments are recessed so the specimens can't be touched when the covers are closed. Slides pop-up with a slight pressure at one end. Each holder is made of heavy pressed cardboard with a white finish. Hinged covers are attached with durable black tape. 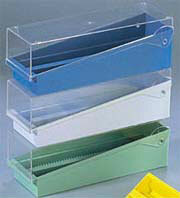 The 20 slide holders are also available with 5 different color tape for easy sorting and storing. The economy pop-up 20 slide holder also holds 20 standard 3 x 1" slides in compartments, numbered to correspond with the printed index on the inside of the cover. Covers are recessed to avoid touching the cover slips on the slides. Slides can easily be removed from the compartments. 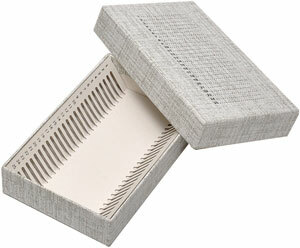 Compartment holder is made from a double layer of densely pressed cardboard, cover is a single layer cardboard. Inside and back are finished with a clear white layer of glossy paper. 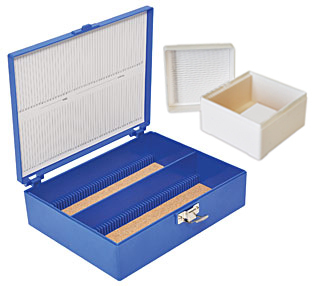 Hinged top covers are finished in matt blue and are attached with thin but durable tape. Newly engineered Slide Folder Rack. 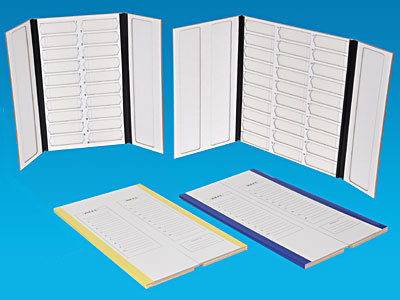 Each tray can accommodate either Cardboard Pop-up 20-slide Folders or Plastic 20-slide Folders. Unique design intuitively directs the appropriate slide folder into the appropriate slot providing equal access to each folder. 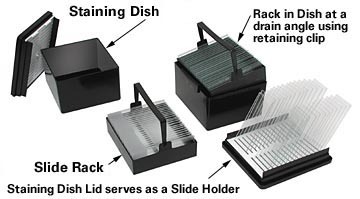 The Slide Folder Rack comes with five trays and a cover. Modular design allows additional trays (product number 2110-9) to be added to the rack. 5 color-coded slide folder clasps that keep the flaps of the slide folders closed are included. Additional clasps are available (product number 2110-10). Cardboard or Plastic Pop-up 20-slide Folders (series 2110 and 2113) are sold separately, not included with the purchase of 2110-8. Clasps for Pop-up Slide Folders. 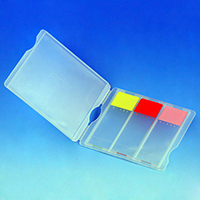 Assorted color clasps are ideal for identification and color coding of slide folders. These clasps keep slide folder flaps securely closed. The clasps may be labeled with a permanent marker or a removable label. Available in clear and in a package of five assorted colors (clear, blue, teal, purple, pink). There are 20 clasps of each color in the assorted color package of 100 clasps. Slides pop-up when pressed on either side and are easily removed. 20 numbered positions. Gray plastic with clear covers or white plastic with black covers. Both trays are not affected by acetone. Two hinged, clear plastic or black covers to hold down and protect slides from dirt and damage. Each is designed to hold up to 20, 3 x 1" slides. 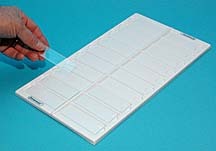 May be used with the PELCO® MICROSLIDES Slide Folder Rack #2110-8. Slides pop-up when pressed on either side and are easily removed. Gray plastic with clear covers or white plastic with black covers. Both trays are not affected by acetone. Two hinged, clear plastic or black covers to hold down and protect slides from dirt and damage. Each holds up to 10, 3 x 2" slides. The most convenient organized and versatile way of storing 3 x 1" or 75 x 25mm slides. Can hold up to 400 slides per unit in just 690 square cm and is stackable for efficient space storage. 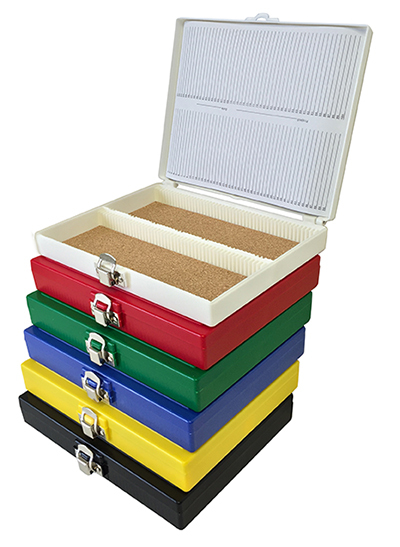 Each SlideFile includes a slide box and a removable tray. A transparent cover reveals the contents. The base is available in 5 different colors for easy identification and to minimize sample mix-up. The slide tray has 100 individual slots. All slides are stored upright for easy insertion and removal. Simply tilt them forward and backward with one finger to easily and rapidly pick up the slide you need. A unique feature with this system is to be able to read bar codes without having to remove the slides from the box. For space saving purposes, you can double the amount of slides simply by storing two slides per slot. For maximum storage space, remove tray and line up 400 slides in 3 rows for long term storage. Includes 2 index cards, numbered from 1-100, for recording slide titles. Dimensions: 82 W x 245 D x 86mm H (3-1/4 x 5-1/2 x 3-3/8"), space for slide 2.9mm, wall thickness between slides 1.6mm. May be used with 21090-1 through 21090-5 HeldSecure™ In/Out Tags and 21090-C Index Cards. 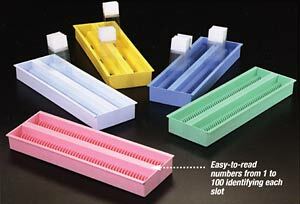 The rugged tray used as a drain rack can hold up to 200 microscope slides in 100 individual numbered slots. All slides are stored upright for easier insertion and removal. Simply tilt them forward and backward with one finger to easily pick up the slide you need. A unique feature is to be able to read bar codes without having to remove the slides from the rack. For space saving purposes, you can double the amount of slides simply by storing 2 slides per slot giving you a capacity of 200 instead of 100 slides. Not autoclavable. Size: 75 x 231 x 25mm (W x D x H), space for slide 2.9mm, wall thickness between slides 1.6mm. 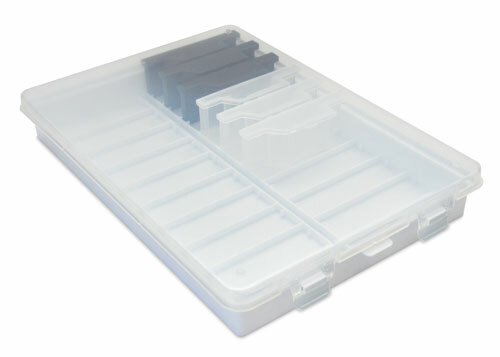 The most convenient organized and versatile way of storing 3 x 1" or 75 x 25mm slides. 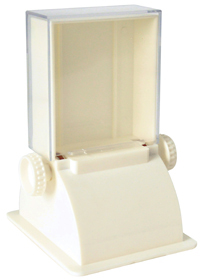 Can hold up to 100 microscope slides in 50 individual numbered slots. 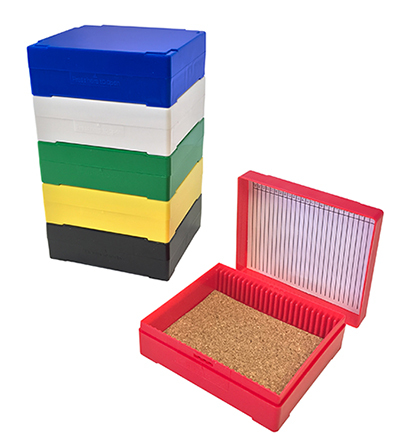 Each SlideFile™ Jr. includes a slide box and a removable tray. A transparent cover reveals the contents. The base is available in 5 different colors. The slide tray has 50 individual slots. All slides are stored upright for easy insertion and removal. Simply tilt them forward and backward with one finger to easily and rapidly pick up the slide you need. A unique feature with this system is to be able to read bar codes without having to remove the slides from the box. For space saving purposes, you can double the amount of slides simply by storing two slides per slot. For maximum storage space, remove tray and line up 200 slides in 3 rows for long term storage. Includes 2 index cards, numbered from 1-100, for recording slide titles. Will resist temperatures from -80° to +80°C. Not Autoclavable. 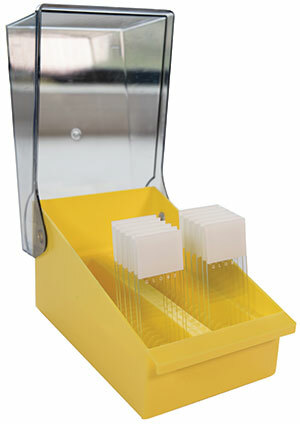 The rugged tray used as a drain rack can hold up to 100 microscope slides in 50 individual numbered slots. All slides are stored upright for easier insertion and removal. Simply tilt them forward and backward with one finger to easily pick up the slide you need. A unique feature is to be able to read bar codes without having to remove the slides from the rack. For space saving purposes, you can double the amount of slides simply by storing 2 slides per slot giving you a capacity of 100 instead of 50 slides. Will resist temperatures from -80° to +80°C. Not autoclavable. Dimensions: 75 W x 125 D x 25mm H (3 x 5 x 1"), space for slide 2.9mm, wall thickness between slides 1.6mm. The standard 23 x 30cm (9 x 12") 3-ring loose-leaf binder comes complete with ten 22 x 27cm (8-1/2 x 10-1/2") vinyl View-Pack Microscope Slide Holder Pages (enough for 160 slides). Each page holds 16 slides 3 x 1" or 75 x 25mm in individual pockets with a white back and clear front. A center flap keeps slides from falling out. Simply fold the page at the center crease to retrieve slides. 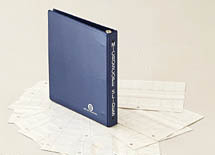 Additional View-Pack Microscope Slide Holder Pages are also available. 10 sheets per pkg. Universal slide rack and container for autoradiography gel staining and staining techniques. Molded of black polyoxymethylene-poly-acetal plastic which has great advantages over glass in all cytological and histological laboratories. The rack and dish are easy to clean and resistant to chemicals used in staining procedures. Note: Slides are not included with any of the Slide Staining and Storage System components. The slides are shown to represent how they are used in the system. The slide rack has an open bottom for rapid draining. It holds 25 each 3 x 1" or 75 x 25mm slides in slots numbered 1 to 25. The handle folds flat on either side. Maximum use temperature 85°C (185°F). The 94 x 81 x 49mm high (3.7 x 3.2 x 1.9") staining dish has a light tight lid, essential to easily evaporated baths and a compartment for a drying agent. The dish accommodates 1 Slide Rack Prod. No. 21078, not included. The perforated slide partition which supports the drying agent has index numbers and a writing surface. A removable clip is placed on the top edge of the dish, permitting the stain solution to drain back into the reservoir from the tilted rack. The actual capacity of the small dish is 250ml but only 150ml is needed, which provides a savings on staining liquids, developing fluids and intermediates. Made from black polyoxymethylene-poly-acetal-plastic, the dish is easy to clean and especially suited to store enzymes. The cover will not jam in freezer storage. Maximum use temperature is 85°C (185°F). 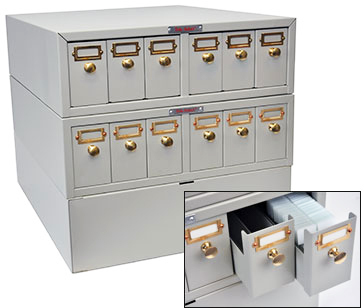 Metal Slide Storage Cabinets provide affordable, sturdy slide storage. These cabinets feature convenient pull knob drawers with metal dividers. Removable drawers feature ball suspension design to prevent accidental pull out. Cabinets lock together when stacked, allowing additional levels of stackable storage on the same amount of counter top or floor space. Cabinet is finished in a powder coat for easy cleaning and durable surface. Each unit has 6 drawers that accommodates up to 5000 slides. 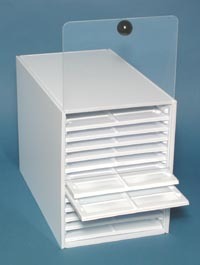 The economy slide storage unit has a capacity for storing up to 1425 standard 3 x 1" (75 x 25mm) microscope slides. 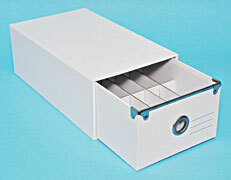 The unit features a single drawer, with reinforced metal corners. The front of the drawer has a finished metal edge and metal-edged drawer pull, as well as a label area for organization and cataloging the contents. The internal partitions keep the slides neat and easy to retrieve. 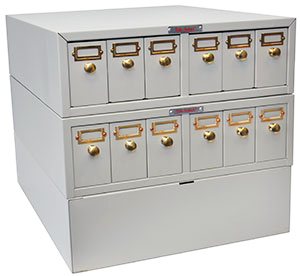 The sturdy heavy pressed cardboard construction has a white satin finish, measures 31.8 x 17.8 x 11.4cm (12-1/2 x 7 x 4-1/2"), and is an economical alternative to the bulky, heavy metal storage cabinets for the active and growing laboratory. 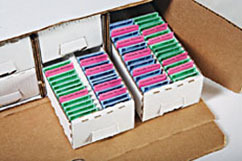 HeldSecure™ is a practical and economical microscope slide and tissue cassette storage system. 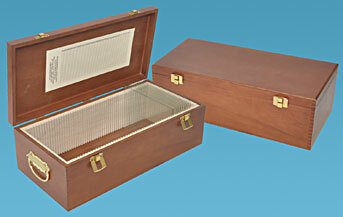 These durable corrugated trays and boxes provide reliable storage and identification for archival slides and cassettes. The HeldSecure™ slide kit contains 4 trays and is designed to hold up to 2,000 slides. 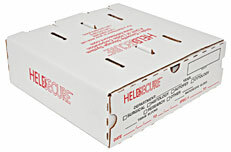 The HeldSecure™ tissue cassette kit contains 8 trays and is capable of storing 500 cassettes per box. 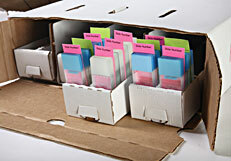 Each kit is equipped with 50 In/out cards and 25 index cards for retrieval and documentation. Bulk cards and tray labels are available separately as accessories. Centered tabs on each box comprise a unique interlocking stacking system that keeps the boxes aligned and stable. The units can stack up to 8-10 high. HeldSecure™ offers a double internal corrugated construction supporting up to 250 lbs. yet allowing easy access to the trays. Archival storage is a necessary part of most histology, pathology and research laboratories. The HeldSecure™ Slide/Cassette Storage Kit is sold in packs of 10, unassembled, with assembly instructions printed on the bottom of each box. This preserves storage space until the need arises and the kits are then available and easily assembled. 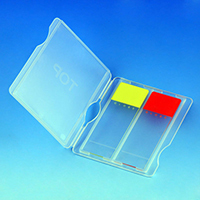 Standard 3 x 1" microscope slides can be placed in the horizontal position for full visibility. Each polystyrene tray is 19 x 34cm (7-1/2 x 13-1/2") and holds 20 slides. May be use in the Slide Tray Cabinet below. 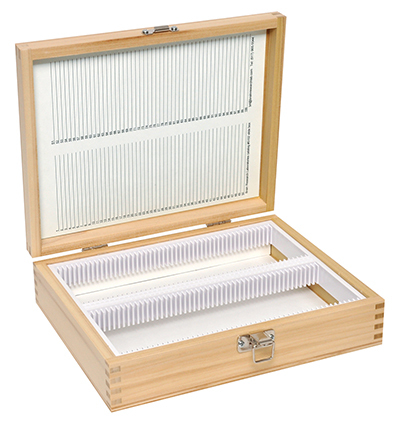 This 240 slide capacity cabinet holds twelve Microscope Slide Trays, shown above (2230), in a dust-free enclosure. The outer shell is white polypropylene, tray rails are polystyrene and the vertical sliding door is clear acrylic with a knob for easy opening. 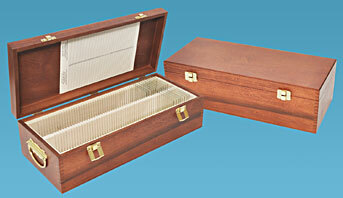 Dimensions are 20.7 W x 25.4 H x 35.5cm Deep (8-3/16" W x 10" H x 14" Deep) Cabinet only, order Slide Trays above. Distance between slide trays when in the cabinet is 1.5cm (0.59"). 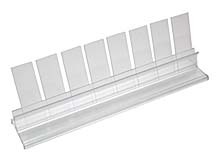 Extruded clear plastic holder 25 x 5 x 2.9cm (10" L x 2" W x 1-1/8" H) with sloping groove which widens at the top to accept single or double slides, maximum 10 standing on end and edge to edge. Front ledge can support slides left to dry (maximum 3 laying on side). Weight 85g (3 oz). Packaged individually. 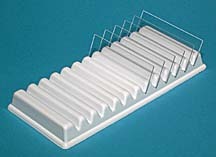 Vacuum formed slide holder for 12 glass microscope slides. Keeps slides separated, visible and orderly. Slides project over edge of holder allowing easy pickup. 86 x 178 x 19mm High (3-3/8 x 7 x 3/4" High). Package of 6. Loading slides made easy. Holds approximately 72 slides of size 3 x 1" (75 x 25mm). Turning either side, wheel dispenses one slide at a time.